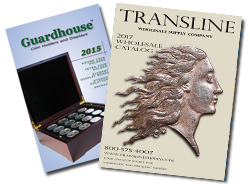 Transline specializes in Coin Displays and Presentation boxes. 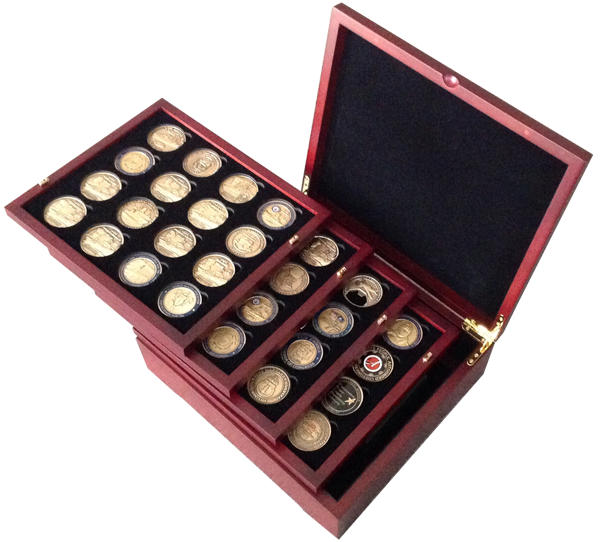 We have everything from Single Coin Display Boxes to Common Mint Set Display Boxes and more! Our Round Coin holders section with best with Guardhouse brand coin capsules, but are universal to all brands of round coin capsules. We also offer several display options for certified NGC and PCGS coins. Solid wood storage and display box designed to hold 45 PSA graded cards. 5 Slab Acrylic Stand. Holds up to 5 graded PCGS, ANAC or NGC coins. These versitle stands allow you to display coins in cases at a 30 degree or 45 degree angle for better customer viewing. Louvre Coin Showcase displays 8 US Slabs (PCGS, NCG, etc.) in a mahogany grain finish with a large glass cover. A magnetic drawer allows for simple replacement of slabs. Includes display stand and wall screws.